Sheltering beneath steeply sloping woodland, Forest Side is an imposing building of Lakeland stone on the road from Grasmere to Keswick. 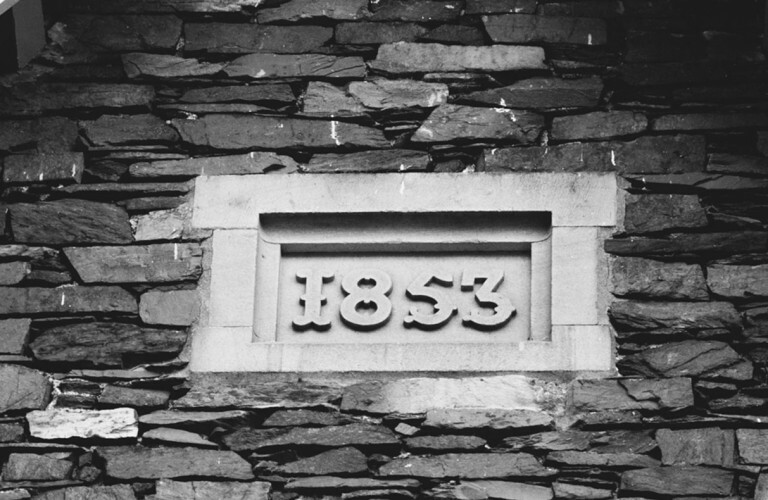 Very much of its time – a plaque on the side of the building gives its date as 1853 – the building we see today clearly has its origins in the spate of gentleman’s residences built after the railway reached as far as Windermere in 1847. As a guide book published in 1853 proudly declared, ‘the District of the Lakes’ is now ‘conveniently approached from all quarters by railway’. Earlier in the century, William Wordsworth, who had led the campaign against the extension of the railway, had enjoyed walking here from nearby Dove Cottage with his sister, Dorothy. He used the dramatic hill-side setting for his narrative poem, Michael, written around 1800, the sad story of a farmer forced by circumstances to sell his farm into a ‘stranger’s hand’. The group of buildings which the Wordsworths would have known dates from the late seventeenth century when it incorporated a smithy and ostler’s house for the Swan Inn, a horse-changing stage. Forest Side later became a farm in its own right, listed in the 1829 edition of Parson and White’s Directory, with John Dixon as the yeoman farmer. Shown on the tithe map of 1838, Forest Side continued to appear in local directories as a farm until 1851, when according to Kelly’s Directory, it was Edward Walker who farmed there. Things were about to change, however. In October 1852 the Westmorland Gazette announced that the property of Mr. William Walker would be auctioned. A year later, in November 1853, another announcement appeared in the local press: ‘On Tuesday last, 47 workpeople, employed on the estate of Stephen Heelis, Esq., who is building a mansion Forest-side, Grasmere, were regaled at Mr Brown’s Hotel, with a substantial supper – no doubt to celebrate the completion of the house we see today. Heelis typifies the wealthy professionals from northern cities who came to the Lake District for its fresh air and beautiful scenery. Born in Bolton in 1801, he was a successful Manchester solicitor whose main residence was at Halton Bank, Salford, where he lived with his wife Ann and their seven children. Conservative in politics, he was a leading member of the Salford Corporation and became Mayor between 1855 and 1857. During his second year as mayor he was offered a knighthood, which he declined. One of the founders of the Manchester Law Society, which continues to award a medal named after him, Heelis was also solicitor for John Owens, the Manchester industrialist, and became one of the first trustees of Owens College (subsequently the Victoria University of Manchester). He was responsible for the large areas of walled gardens which still exist today. In September 1858 the Westmorland Gazette reported on the ‘great success in rearing wallfruit’ achieved by the Forest Side gardener, Mr. Roberts. However by this time both his youngest daughter and his wife had died. It seems likely that it was following his wife’s death in 1858 that Heelis decided to sell Forest Side, as in March 1859 the local press were advertising the property for sale. Stephen himself died on 26 August 1871. He, his wife, daughter and a son are all buried in Grasmere churchyard. It is not quite clear when James Harrison actually acquired Forest Side. A hand-drawn plan of the house and land headed ‘Forest Side Estate in the Township of Grasmere’ is inscribed ‘Stephen Heelis to James Harrison purchase money £7000’ but is frustratingly undated. Harrison was living there on 25 August 1860, when he advertised two horses for sale in the Westmorland Gazette, however, he and his wife were not there long, because a year later, in August 1861, a sale of furniture was advertised in the Westmorland Gazette. The next owner was a silversmith from Sheffield who was certainly living in the house by April 1863 from the announcement of his marriage in the Westmorland Gazette. Born in 1793, he was 70 at the time of his marriage to the 20-year-old, Emily Barker, ‘only daughter of the late Wm. Barker, Esq., of Huddersfield’. On 2 July the following year, it was announced in both the Kendal Mercury and the Westmorland Gazette that Younge’s wife had given birth to a daughter, Edith Mary, who was christened at Grasmere Church on 11 August 1864 on 26 June. Charles died two years after the birth of his daughter, a memorial in Grasmere Church records that he died in November 1866 aged 74. Mrs Younge decided to sell the property after a number of years, and on 12 June 1888 Forest Side was put up for auction at the Mitre Hotel, in Manchester. As well as ‘the mansion house, called ‘Forest Side’ there were also the ‘Coach-house, two stables, two cottages, walled kitchen garden, conservatory and vinery and the extensive pleasure grounds, shrubberies and plantations surrounding or near to the house (including a noble avenue of trees and shrubs leading thereto from the carriage entrance to the grounds), all situate in the Parish of Grasmere’, the estate consisting of a total of 50 acres including pieces of ‘meadow and pasture land’. Despite the glowing descriptions it seems there was no interest in Forest Side and in 1893 it was on the market again, this time the auction was to be held in London. Liverpool businessman, Edmond Brownbill, J.P., attracted by the fulsome descriptions of Forest Side, bought the property and was listed as owner in 1897. The Brownbill’s were still at Forest Side in 1914 when Kelly’s Directory described the house as ‘the second of the principal seats’ in Grasmere. Edmond Brownbill died on 12 December 1914 having owned Forest Side for 17 years. Forest Side continued to be listed in the Directories as ‘one of the principal seats’ until 1921 when William Alexander Duncan was owner. But in 1925, under the ownership of Thomas Dixon, Forest Side had lost its prestigious status and was placed under the heading Commercial. By 1929 Forest Side had lost all claim to status, the owner given as the Co-operative Holidays Association, who provided organised holidays in the countryside for young working-class people as an escape from growing industrialisation, the emphasis was very much on communal living with walking during the day, and social events in the evening. Forest Side remained in the ownership of the organisation, later the Countrywide Holidays Association, until the end of the twentieth century, when it became a hotel.